D-Arabitol is the reduced alcohol form of D-arabinose. It is produced by some fungus from enzymatic dephosphorylation and reduction of D-ribulose-5-phosphate. 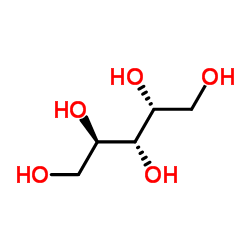 D-arabitol is metabolized by a variety of different bacteria utilizing an arabitol dehydrogenase enzyme. The arabitol dehydrogenase gene has been introduced into plants to serve as a positive selection marker for transgenic cells.